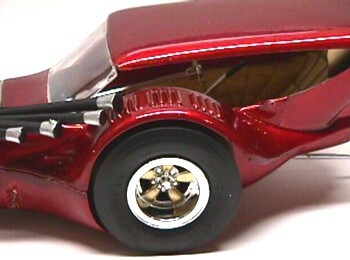 This is the T'rantula, with a blown Chevy straight 6. painted with a gold base coat, candy apple red, and 3 coats of clear. 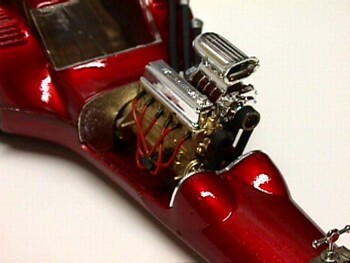 I got this kit from Paul Canney, so I could use the chrome engine parts on a box stock T'rantula. This is an original 1968 issue kit. I had to put the body in the freezer for about an hour to break all of the glue that was holding it together. I took the whole car apart, cleaned it, painted it, and put it all back together. The big twist is that I used the straight 6 with a blower. 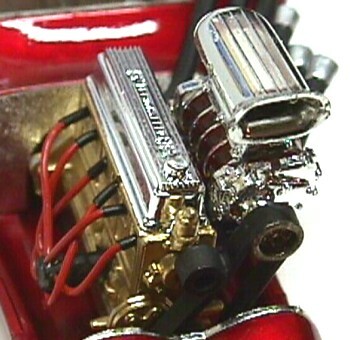 The motor is sprayed gold, and has a parts box blower with a scratch-built intake manifold. I cut the T'rantula headers apart and formed them to fit the straight 6. I drilled holes in the block for the headers to fit into. I wired up a scratch-built magneto (made from an old distributor). The interior is sprayed gold, with a dull coat over it. I had to spray the quad lights in the front gold too, because the chrome was pretty bad. The light lenses are painted candy red. I painted the spokes on the rear mags gold, and the centers of the front wheels gold. I didn't have the spoked wheels for the front, so I put the solid wheels on in their place. The only part that is missing, is the steering linkage rod.